For the Intellivision game, see Tower of Doom. 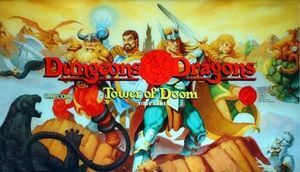 Dungeons & Dragons: Tower of Doom is the first of two Dungeons & Dragons arcade games produced by Capcom. 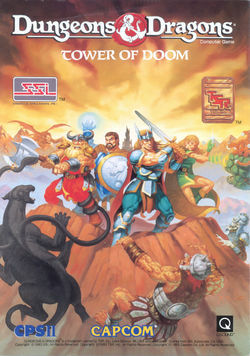 Unlike their usual beat 'em ups, Tower of Doom features RPG elements including gold, shops, spells, item equipping and more. Rather than a simple magic or special button like Golden Axe or Knights of the Round, Capcom also added a Select button for choosing spells and items at will, rather than having one automatically selected. There is a greater emphasis on weapon-based attacks rather than grabs and throws, and there are no desperation attacks unlike in most Capcom beat-'em-ups (usually executed by pressing attack and jump together). The game takes place in the Mystara campaign setting. Enemies and locations familiar to D&D veterans abound, and behave much the same as their Monster Manual descriptions. Even some bosses had to be defeated in the way described in the source material. The game makes very little use of palette-swapping for harder enemies, and instead largely replaces basic foes with entirely different enemies as the players progress. Despite the inevitable changes involved with making D&D into an action-RPG, Capcom wanted it to be true to the source material while keeping it fun for those new to D&D. They recruited RPG veteran Alex "Raven" Jimenez for the job. In an interesting step, they decided to first test the story and areas with D&D players as a traditional pen-and-paper adventure. Among the changes made during playtesting was raising the characters' starting levels (in D&D, new characters always start at level 1). In addition to the usual attribute differences, characters also have restrictions imposed upon them like their D&D counterparts: the Cleric cannot use arrows or bladed weapons for religious reasons, and only the Cleric and Elf can use magic. The Cleric also has unlimited use of a Turn Undead spell (instantly killing any Skeletons or Ghouls on the screen), making him an important party member. Characters can also earn experience over time, which unlike Capcom's past games is more than just a score counter. Players are also able to choose their path both between and within stages, meaning they never had to play exactly the same stages as last time. The game's success led to the release of Dungeons & Dragons: Shadow Over Mystara three years later. In 1999 Capcom made some aesthetic changes and released both games for the Sega Saturn as part of the Dungeons & Dragons Collection. This page was last edited on 24 September 2017, at 13:19.